Kevetrin’s Effect on the p53 Signaling Pathway in a Broader Scientific Context — Innovation Pharmaceuticals Inc. The Company has provided an update on Kevetrin -- its p53-modulating, anti-cancer drug candidate -- currently being studied in a Phase 2a trial for platinum-resistant/refractory Ovarian Cancer (OC). Earlier, the company successfully completed a Phase 1 study in Advanced Solid Tumors, which was conducted at Dana-Farber Cancer Institute and Beth Israel Deaconess Medical Centers. A primary goal of the Phase 2a OC study is to evaluate changes in biomarkers and molecular signatures related to cell proliferation and cell death. In particular, the Company would like to better understand how Kevetrin affects p53 -- a tumor suppressor protein produced by the TP53 gene and common to most animals -- via pathway analyses of RNA and protein biomarkers collected from patient tissue and blood samples. Preliminary results show modulation of the p53 protein, as well the activated form of the protein, phospho-p53, in response to the administration of Kevetrin. Pathways analyses also point to concomitant cell cycle modulation at the level of gene expression. Importantly, these data directly support Kevetrin's ability, in ovarian cancer patient tumors, to affect p53 and associated molecular pathways -- the central gene signaling network involved in regulating cell growth and the cell cycle, helping to prevent cancer. Referred to as the "master switch" given its central role in regulating the highly distributed gene signaling network controlling cancer, arguably there is "no gene more important" than p53: "The loss of TP53 as signature driver of human cancers is indisputable." It is the most "scrutinized" gene of all time (p53 in a scientific context); toward cracking p53, unraveling its many mechanisms, on average, approximately two p53-related research papers are published each day. A 2016 article, “Targeting Mutant p53 in Cancer: A Long Road to Precision Therapy,” excerpted below, reinforces the importance of performing pathway analysis of the kind Innovation research staff currently are engaged in -- efforts to better understand cell cycle and cell death regulation in relation to Kevetrin's ability to modulate the p53 pathway in cancer. "Recent studies indicate that successful strategies to extract core aspects of mutant p53 oncogenic potential and to identify unique tumor dependencies entail the superimposition of large-scale analyses performed in multiple experimental systems, together with a mindful use of animal models. This will hopefully soon lead to the long-awaited inclusion of mutant p53 as an actionable target of clinical antitumor therapies." A 2017 article, "Cancer in the Crosshairs," on research out of UC Santa Cruz, makes a similar point, highlighting the importance of the Retinoblastoma (Rb) tumor suppressor protein -- a central player in many signaling pathways disrupted in cancer cells. In pre-clinical work, Kevetrin was shown to target the Rb-E2F signaling pathway (see the 2012 AACR abstract and poster, pdf). Running in parallel to the p53 molecular pathway mapping efforts, the Company has plans to develop Kevetrin as an oral agent (tablet or capsule) that could be dosed multiple times per day. This approach leverages Kevetrin's pharmacokinetic profile and short half-life -- approximately 2 hours, with the drug clearing the body within one day, though on average between 8 and 10 hours. Bioavailability and other lab studies have been encouraging. Currently there are no approved p53-modulating drugs, much less in pill form. An oral formulation of Kevetrin could, one day, potentially position the drug candidate -- whether as a monotherapy or used in combination with other agents -- as a go-to cancer treatment, which remains the top therapeutic area of focus in Biopharma R&D. 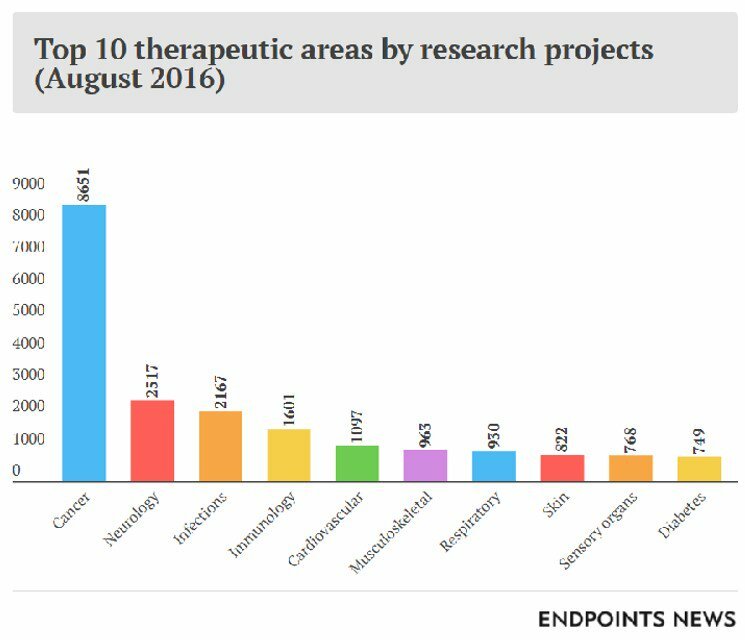 With cancer immunotherapies comprising the majority of oncology-focused drug development efforts (over 2000 agents presently are in the clinical pipeline), by 2022, it is estimated that the top 15 cancer drugs, collectively, will bring in almost $90 billion in sales. Innovative gene therapies, in particular, likely will merit much higher prices than conventional drugs. Source: 2017 AACR Meeting: "Kevetrin induces p53-dependent and independent cell cycle arrest and apoptosis in ovarian cancer cell lines representing heterogeneous histologies." Scientific Poster (pdf). Source: "A Cancer Pathway Identified, Suggesting Targets for Future Therapies." SCOPE. Stanford University. October 10, 2017. Source: Dolgin, E. "The Most Popular Genes in the Human Genome: A Tour Through the Most Studied Genes in Biology Reveals Some Surprises." Nature. News Feature. 22 November 2017. A wide variety of regulators govern the activity of p53 (top), which, in turn, controls many distinct biological processes (bottom). Each node represents a gene and each line represents an interaction. Direct p53 inputs are indicated as blue lines and direct p53 outputs are indicated as red lines. Noticeably, p53 controls effector processes by activating multiple target genes. Downstream pathways are highly interconnected (gray lines). Interactions are annotated as positive (arrow), negative (T-bar), or modifying (solid circle). Source: Kastenhuber, Edward R., Lowe, Scott W. “Putting p53 in Context.” Cell. Volume 170, Issue 6, 7. September 2017, Pages 1062-1078.